These are two simple recommendations but can have lasting impact for leaders. I’ve certainly been burned by assuming things. And I know I’ve hoped for things without actually planning for them. 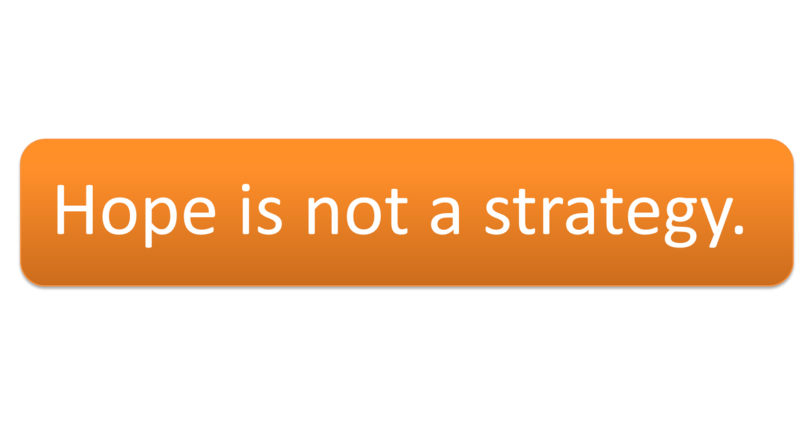 To achieve goals requires a strategy, defined by Dictionary.com as “A plan of action or policy designed to achieve a major or overall aim.” Without a plan of action, hoping and assuming will not achieve goals. As Jim said, hope is not, and never should be, a strategy. This entry was posted in Business Strategy, Leadership and tagged Business strategy, CEO, CEO leadership, Communication, Corporate strategy, leadership, Management, strategy. Bookmark the permalink.